Health Costs > How Much Does an Ambulance Ride Cost? An ambulance ride is most often the quickest way to get to the hospital in the case of an injury or serious illness such as a car accident or heart attack. The cost of an ambulance ride can depend on the company, the miles being driven, the reason you had to ride in one and if insurance is involved. A basic ambulance ride to a hospital, for example, can cost a lot less than a paramedic unit. On average, an ambulance company will charge anywhere from $350 to as much as $2,000 for a trip without insurance. We explored multiple cities throughout the United States and included the prices we had found inside the table below. Even with health insurance, an ambulance ride may not be covered 100 percent. Refer to your insurance documentation to see exactly what is covered; most of the time, the insurance company will only cover the payment if it were a medical necessity and your life was in danger. Some insurance policies have a flat fee/co-pay, while others may say you are only responsible for the deductible. According to this LaTimes.com article, a patient was billed more than $1,538 for her ambulance ride. This was after the insurance company had paid more than $750. AberdeenNews.com claims ambulance rides within the area of Aberdeen can vary anywhere from $550 to $1,000, but the most common charge for a ride is around $675. The least expense trip is one that is deemed as a non-emergency. On top of the standard fee, companies may also charge $12.50 per mile driven. A member on Reddit.com said they received a bill for $1,157. $13 was for the mileage, $80 for the oxygen, $25 for the supplies and $1,000 as the base price. In an emergency situation, the ambulance provider will determine which type of truck needs to be dispatched (basic or ALS) depending on the circumstances. During the ambulance ride, the crew will assess the patient’s medical condition and check vital signs to determine the best course of action. Basic life support trucks will work with non-threatening injuries, continuing monitoring to a destination, while an advanced life support truck, will be dispatched for life-threatening situations. An ALS crew can administer medication, perform CPR, insert breathing tubes and perform other procedures. When you receive a bill from an ambulance service, it should have an itemized bill, showcasing the price for each item. If you feel that you never had that treatment or you want to dispute the charges, be sure to call up the ambulance company or insurance company to dispute these charges. If the service doesn’t offer an itemized bill, be sure to ask for one. Aside from transportation to a hospital, ambulance providers can take a patient to a nursing facility, rehabilitation center, home health agency or hospice center. If other medical equipment or medication is used during an ambulance ride such as IVs or oxygen, the costs can rise. Advanced life support, when compared to basic life support, can cost even more. The Arizona Republic even said blankets and bandages are billable if you were to use them during the ride. Plan on spending at least $3 to $10 per mile driven if the ambulance has to drive outside of its radius. If the ambulance has to standby at the hospital and/or a location, it can cost up to $200 per hour. Why is an ambulance ride so expensive? Regardless of how many 911 calls are made in a day, an ambulance service still has to be available for 24 hours per day, staffing crew members and maintaining the vehicles available. This also doesn’t include the salaries and the fuel being used. 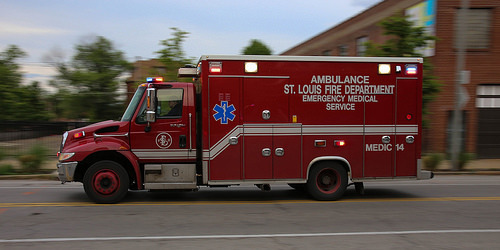 Many ambulance companies have a payment plan if you can’t afford to pay the payment in full. If you pay up front in full, most of the time, they will usually offer a discount that is more than 40 percent. Each company will have its own policy, so be sure to call them and ask before paying the payment in full. If you cannot afford the bill, talk with your local city as many have plans set up that can help those that meet certain income requirements. The La Times says you can appeal a bill if you feel the bill seems either too high or improper. Both private insurance companies and Medicaid will cover an ambulance ride as long as the ride is a necessity and endangers your health. If it’s avoidable, skip the ambulance and drive to the hospital with a friend or family member. As you can see, the prices can be quite steep. Even if you don’t have someone to drive you, consider something such as Uber or Lyft. Trip was 1.5 miles, was charged for 5 miles. My wife took me to an emergency clinic/care place. They said that I had to be ambulanced to the local hospital ER. I told them that my wife would drive me, but they strong armed her into letting them call an ambulance. It was maybe 15 minutes in an ambulance, no lights, no siren, no drugs, nothing. They were nothing more than a glorified $1600 taxi ride. I was having a miscarriage I didn’t even know I was pregnant. I called 911 I was in so much pain and couldn’t drive I only live 5 minutes from the hospital, the paramedics didn’t do anything other then transport me and asked a few questions and I’m being charged $2900, not only that to add salt to the wound they sent me a bill for a miscarried baby that according to them was also transported total $5800. what a rip off.. this is wrong….highway robbery!! 13 miles, two of us in same ambulance. Husband got no services during ride. I was on the gurney. They charged us each 2048.88!